(From left) Allen Homra and Melanie Baden present a donation of $7,000 to Peter Emanuel, M.D., director of the UAMS Winthrop P. Rockefeller Cancer Institute, in memory of Homra’s wife, Stacey Gabriel Homra. Nov. 20, 2017 | LITTLE ROCK –A donation of $7,000 in memory of the late Stacey Gabriel Homra of Stuttgart will benefit cancer research conducted by the Winthrop P. Rockefeller Cancer Institute at the University of Arkansas for Medical Sciences (UAMS). 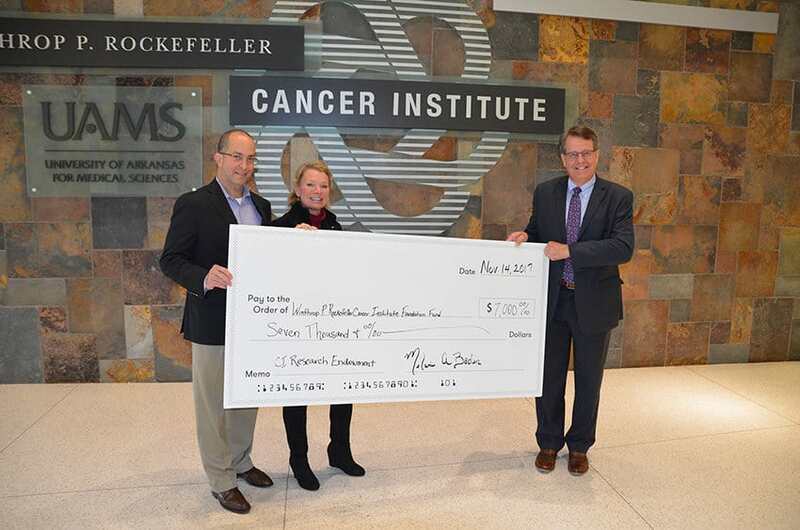 The donation was presented Nov. 14 to Cancer Institute Director Peter Emanuel, M.D., by Homra’s husband, Allen Homra, and long-time friend, Melanie Baden. Baden raised the money through an online fundraising campaign following Homra’s death in September from glioblastoma, a rare form of brain cancer. The campaign was conducted in conjunction with Baden’s hike through a section of the Appalachian Trail known as the 100-mile wilderness. Having already hiked 1,250 miles of the trail, which extends from Springer Mountain in Georgia to Mount Katahdin in Maine, Baden will complete the total 2,189-mile trek in May 2018. “I started the 100-mile wilderness hike on Oct. 5. Because Stacey passed away a few days before that, I decided to use that hike as a way to honor both her memory and the dedication of her husband, Allen, and daughter, Madison,” Baden said. Her campaign raised $7,000 in 13 days, with many donations coming from as far away as California and Hawaii, in addition to many from Stuttgart friends and relatives. It will be used to support cancer research at UAMS, where Homra underwent treatment following her diagnosis in 2014. “We are grateful to Ms. Baden for her foresight in raising these funds and to Mr. Homra for choosing to designate them for cancer research. The generosity of each person who donated to this campaign will have an impact in our ongoing fight against cancer,” said Emanuel, who also serves as a professor in the UAMS College of Medicine. Baden will accept additional donations in honor of the Homras when she resumes her hike in the coming months.